In my life we'll always go on." 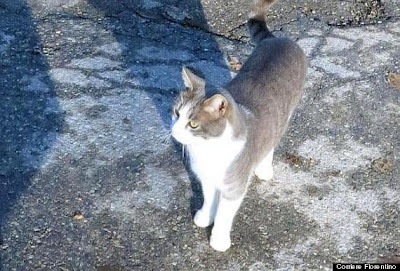 In the small town of Montagnana in the province of Padova a three-year-old gray and white cat named Toldo is quietly going about disproving the often voiced opinion that members of his species are soulless, uncaring creatures whose only interest in their caretakers consists of what they can get out of them. He is doing this by continuing to visit the grave of his caretaker, Renzo Iozzelli, who died on September 22, 2011 at the relatively young age of seventy-one. On these occasions he also brings along with him little tokens of affection that he deposits on the grave. Although these gifts consist primarily of sticks, leaves, twigs, plastic cups, and paper towels, that in no way diminishes either their value or the considerable amount of thought and effort that goes into their procurement and delivery. Toldo's trips began the day of his owner's funeral when he dutifully followed the coffin as it made its journey from his house to the graveyard. Iozzelli's widow, Ada, immediately suspected that something out of the ordinary was occurring when she visited the grave the following morning and found a sprig of acacia lying on top of it. Her daughter, however, dismissed that notion as nonsense. "Andammo al cimitero con mia figlia e trovammo sulla tomba un rametto di acacia," Ada told the Corriere Fiorentino of Firenze on December 28th. 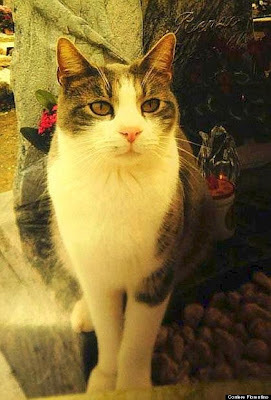 (See "Gatto visita tomba del padrone, ogni giorno con un piccolo dono.") "Io pensai subito che fosse stato il gatto, ma mia figlia era convinta che lo dicessi solo per lo stato emotivo in cui mi trovavo in quei momenti." Ada's intuition soon was proven to be correct when her son-in-law visited the grave later that night and found Toldo standing guard over it. After that it did not take long for word of his devotion to Iozelli to spread far and wide. "Sometimes he comes with me and sometimes he goes on his own," Ada told the Independent Online of South Africa on January 4th. (See "Cat Brings Gifts to Master's Tomb.") "The whole town knows about him now." Not only Montagnana's ninety-five-hundred inhabitants but all of Italy as well following the intervention of both the electronic and print media. Later, the story went viral on the Internet and thus transformed Toldo into an overnight international celebrity. Even when she occasionally loses track of his peramublations her neighbors gladly fill in the gaps for her. "Anche oggi sono andata al camposante e Toldo mi è venuto dietro," she told the Corriere Fiorentino. "Per strada una persona che conosco mi ha detto che stamani, di buon' ora, il gatto era già stato lì." Winning the affection of a cat is really not all that different from anything else in life in that the rewards to be derived from such an undertaking are commensurate with the amount of time, effort, and care that go into it. In Iozelli's case, not only did he rescue Toldo from a colony when he was only three months old but afterwards he took especially good care of him. "Mio marito era molto affettuoso con lui. Renzo amava gli animali," Ada told the Corriere Fiorentino in the article cited supra. "È quasi come se Toldo volesse essergli riconoscente. È un gatto speciale, non si può che volergli bene." The good news is that Toldo, as far as it could be determined, has not been injured by any of these unprovoked and totally uncalled for attacks. Nevertheless, it is incumbent take caretakers at the cemetery, the local authorities, and animal protection groups in the area take immediate steps in order to ensure his safety by arresting those responsible for these reprehensible attacks. Back in 2010, noted chef Beppe Bigazzi of the popular "La Prova del Cuoco" show on state-owned RAI-Uno TV extolled the pleasures of eating cats. "Leave it (a dead cat) for three days under a stream of running water (to tenderize the meat) and you end up with a delight," he was quoted in the February 16, 2010 edition of The Telegraph as proclaiming. (See "Cat Meat Menu Unleashes Italian Outrage.") "I've eaten its delicious white meat many times." The issue of Toldo's safety is temporarily is abeyance because all the trips to the cemetery coupled with the inclement weather have taken their toll on him. "He's not going out as much these days," Ada told the Independent Online in the article cited supra. "He's caught a bit of bronchitis so he's sleeping next to me." Perhaps by the time that he has recovered he will have realized that Iozelli is not coming back and accordingly will remain at home. That not only would be better for his mental health but it also would put an end to the savage assaults being directed against him. "He loved my husband. It was something else!" Ada added to the Independent Online. "Now it's just me, my daughter and my son-in-law and he's very affectionate with us too." Indeed as Charles Dickens once opined, "What greater gift than the love of a cat?" That alone makes it all the more imperative that Ada and her family take especially good care of Toldo. Renzo would not expect anything less of them. Dogs likewise have been known to exhibit similar unstinting loyalties to their departed owners. Take, for example, the case of a seven-year-old Alsatian named Tommy who is still attending mass every day just like he did with his owner, fifty-seven-year-old Maria Margherita Lochi, before she passed away back in November. "He's there every time I celebrate mass and is very well-behaved. He doesn't make a sound," Father Donate Panna of Santa Maria Assunta Catholic Church in San Donaci in the province of Brindisi on the southeast coast of Italy told Opposing Views of Los Angeles on February 13th. 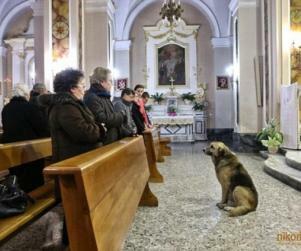 (See "Loyal Dog in Italy Attends Mass Daily Since Owner, Maria Lochi, Died.") "He's still coming to mass even after Maria's funeral (where) he waits patiently by the side of the altar and just sits there quietly." Unlike the hostile reception that Toldo sometimes receives whenever he visits Iozelli's grave, parishioners at Santa Maria Assunta so far have not complained about Tommy stopping by on his own and Panna, a dog lover himself, accordingly tolerates his presence. "I didn't have the heart to throw him out," he told Opposing Views. "I've just recently lost my own dog, so I leave him there until mass finishes and then I let him out." There is some confusion, however, surrounding Tommy's current living arrangement. Whereas some press reports maintain that he along with Lochi's two other dogs have found new homes, other dispatches claim that he is being cared for collectively by villagers in the agricultural town of seven-thousand souls. "Ho da poco perduto il mio cane investito da un' auto e qualche giorno fa mentre ero a passeggio con mia moglie mi sono imbattuto in Tommy, abbiamo pensato subito di adottarlo," mayor Domenico Serio told La Repubblica of Bari on Janaury 15th. (See "Il cane che torna e aspetta ai piedi dell' altare ogni giorno in chiesa piange la sua padrona.") "Quand lo abbiamo chiamato ci ha allungato la zampa, famigliare, ci siamo diretti verso casa e lungo il percorso gli si sono avvicinati il venditore di panini, il macellaio, ed altri. Mi sono insomma accorto che la gente dell' intero paese lo aveno già adottato, e non ho avuto cuore di strapparlo alla comunità. I bambini gli hanno anche trovato un posto dove dormire: Tommyè insomma il cane di tutti." Considering that Lochi originally rescued him from a field, the very last thing that he needs in his time of bereavement is to be abandoned again to his own devices. It also is vitally important that his trips to church do not subject him to predation by motorists as was the case with Serio's dog. 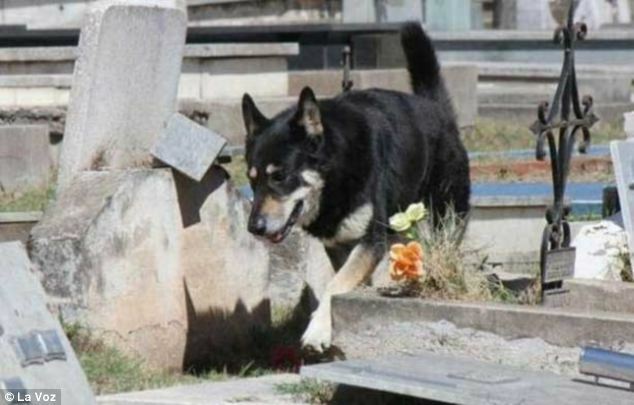 An even more astounding story of a dog's devotion to his deceased owner has been circulating in Villa Carlos Paz, a medium-sized town of fifty-six-thousand inhabitants in the province of Córdoba in central Argentina. It concerns a dog named Capitán who allegedly has been standing guard over the grave of his dead owner for the past six years. This love affair which has transcended the grave began in 2005 when Miguel Guzman purchased him as a present for his son, Damían. He later passed away in March of 2006 but Capitán somehow found his way to his grave in January of 2007 and since then has rarely left it. "He turned up here one day, all on his own, and started wandering all around the cemetery until he eventually found the tomb of his master," cemetery director Hector Baccega told Opposing Views on September 18th. (See "Dog Loyally Guards Master's Grave for Six Years, Family Says.") "During the day he sometimes has a walk around the cemetery, but always rushes back to the grave. And every day, at six o'clock sharp, he lies down on top of the grave and stays there all night." Local veterinarian Guillermo Bur attributes Capitán's discovery of Guzman's grave to his species' renowned sense of smell. "El perro lo rastréo, lo buscó día tras día," he theorized to La Voz of Córdoba on September 13th. (See "El fiel Capitán habría Ilegado siguiendo el rastro.") "El perro piensa que el hombre está ahí y se queda. El víinculo que existe hace que lo espere." In spite of all of that, his family has attempted on many occasions to coax him into staying at home. "I've tried to bring Capitán home several times, but he always comes straight back to the cemetery," Damían told Opposing Views in the September 18th article cited supra. "I think he's going to be there until he dies too. He's looking after my dad." On that point Guzman's widow, Verónica, is in complete accord. "I don't think he wanted to leave Miguel on his own at night," she said of the failed attempts to get Capitán to sleep at home. Fortunately for him, Baccega and his staff have taken over his care by feeding and watering him. Capitán's exemplary loyalty additionally has put Villa Carlos Paz on the map and led to an increase in tourism. "Los autoridades de Turismo le tendrían que dar un premio al perro por la publicidad que le está haciendo de la ciudad," an unidentified woman visiting the cemetery remarked to La Voz in the article cited supra. Deceased owners are not the only recipients of such exemplary canine devotion in that such sentiments are sometimes extended to other animals as well. 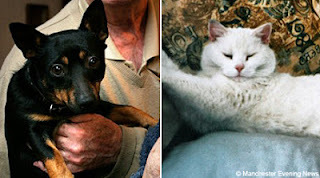 For example, in the home of Robert and Mavis Bell in the borough of Wigan in Manchester, an eighteen-month-old Lancaster Heeler named Oscar developed an especially close relationship with a white-colored cat named Arthur. Not surprisingly, when Arthur died in late 2007 Oscar had a very difficult time accepting the cold, hard reality that he was gone for good. As a consequence, he retrieved Arthur's lifeless corpse from the garden where it had been buried and spent the rest of the night licking the sod from it. "He managed to climb out through the cat flap in the night, obviously with the intent to get Arthur back," Robert later explained. "Then he pulled him into the basket and went to sleep next to him." Not only that but it need not last for very long in order to have a profound impact. Once it arrives, however, nothing ever will be quite the same again for either good or bad. The good part about love is the happiness that it brings with it; the bad part consists of the inconsolable pain and emptiness that lingers on long after it is gone. The only consolation lies in accepting that one is not possible without the other. Finally, anyone even remotely familiar with cats, dogs, and other animals understands only too well that the notion that they do not have souls is pure nonsense. Such an inquiry would be more fruitfully directed at man himself. "As long as man continues to be the ruthless destroyer of lower beings, he will never know health or peace," the presocratic philosopher Pythagoras pointed out more than twenty-six-hundred years ago. "For as long as men massacre animals, they will kill each other. Instead, he who sows the seeds of murder and pain cannot reap joy and love." Even in uttering those lofty sentiments Pythagoras erred grievously by dismissing the animals as "lower beings." As Mark Twain so forcefully put it in his essay "The Lowest Animal," it is precisely man who is the basest and most contemptible of all creatures and he proves it millions of times each day through his systematic exploitation and abuse of the animals, Mother Earth, and his fellows. Photos: Corriere Fiorentino (Toldo), Opposing Views (Tommy), La Voz (Capitán), and Manchester Evening News (Oscar and Arthur). 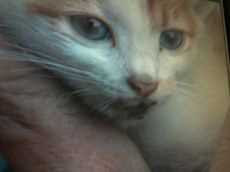 Considering that motorists deliberately run down and kill hundreds of thousands, if not indeed millions, of them each year it is nothing short of remarkable, although by no means totally unheard of, every time that one of them actually goes out of her way in order to save a cat's life. That is even more so the case when such a kindhearted individual is willing to pay for the cat's emergency veterinary care out of her own pocket. As astounding as that may sound to some skeptics, Hannelore B. of München is such a person. As it shortly became clear, his eyes were deceiving him and what he actually had seen was a rather frightened cat. The couple then attempted several times in vain in order to signal the trucker to stop. Hannelore was not about to be deterred, however, and instead hurriedly scribbled "Katze! Hinten!" on a scrap of paper which she then held up to the window of her chariot. That finally got the driver's attention and he promptly pulled over at the Ulm-Elchingen Interchange where the A8 and A7 intersect. That spontaneous act of heroism and compassion in all likelihood saved the cat's life because she easily could have either fallen or been blown off the speeding rig at any moment and into the path of the oncoming traffic. Even as things were, she was in pretty bad shape. 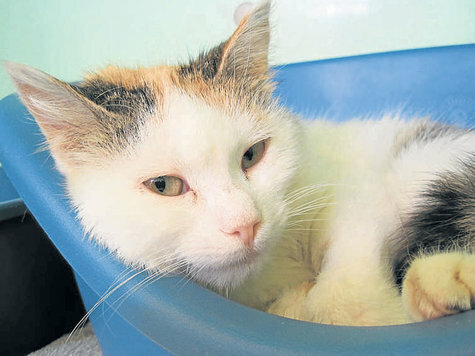 "Da war die Katze mehr tot als lebendig," Hannelore told TZ-Online in the article cited supra. "Sie war verletzt, das Fell war ölverschmiert." Hannelore and Erich then drove the cat to the Germeringer Tierklinik in Fürstenfeldbruck, roughly twenty-five kilometers west of München. Compassion seldom comes cheap, however, and the veterinarians reciprocated by sticking the couple with a bill for €197 in return for attending to the cat's various, unspecified injuries. The magnanimous couple neither winced nor demurred but instead gladly coughed up the cutthroats' blood money. As a consequence, the cat escaped not only with her life but a new moniker as well: Mausi. By their actions, Hannelore and Erich once again have proven that the only charity worthwhile comes from the heart. Likewise, by even charging for saving Mausi's life the practitioners at Germeringer Tierklinik have demonstrated anew that the veterinary medical profession is comprised almost exclusively of mercenaries. 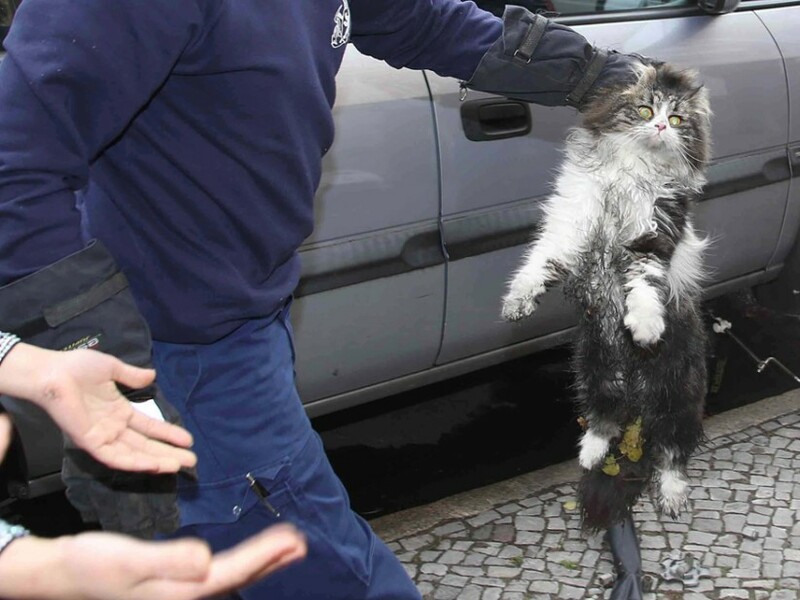 Soon after being treated, Mausi was handed over to Tierschutzverein München (TSV) where an immediate search was undertaken in order to locate her owner. Since the trucker had departed from Obertaufkirchen im Landkreis Mühldorf am Inn and, apparently, had not made any stops along his two-hundred-ten kilometer trek, TSV concentrated its search in that community. The organization ultimately was able to locate the village where Mausi had lived but no one there was willing to come forward and reclaim her. All that TSV was able to learn was that she had been let out of an automobile at a commercial park. It thus appears that she had been intentionally abandoned. After that she likely crawled into the truck's engine in order to keep warm and that would account for the oil in her fur. Even though the pretty little girl quickly recovered from her harrowing ordeal, she nonetheless was forced to spend the next two months at TSV where she likely was confined to a cage. Her ship finally did come in, so to speak, when she belatedly was adopted by, hopefully, a loving and caring family who will appreciate and treasure her for as long as she lives. 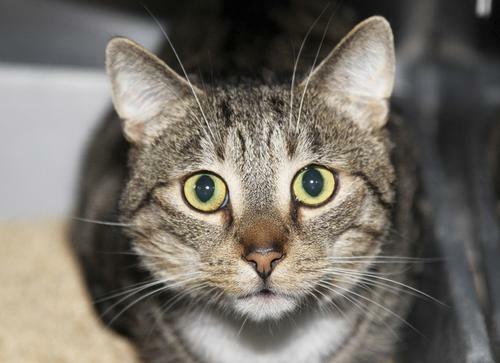 Cats that are drawn to the shelter and warmth provided by automobile motors invariably wind up in all sorts of dire straits. Although the injurious and deadly consequences of this perennial problem easily could be remedied if only motorists would check underneath their hoods before starting their engines that is not about to become common practice in a million years. 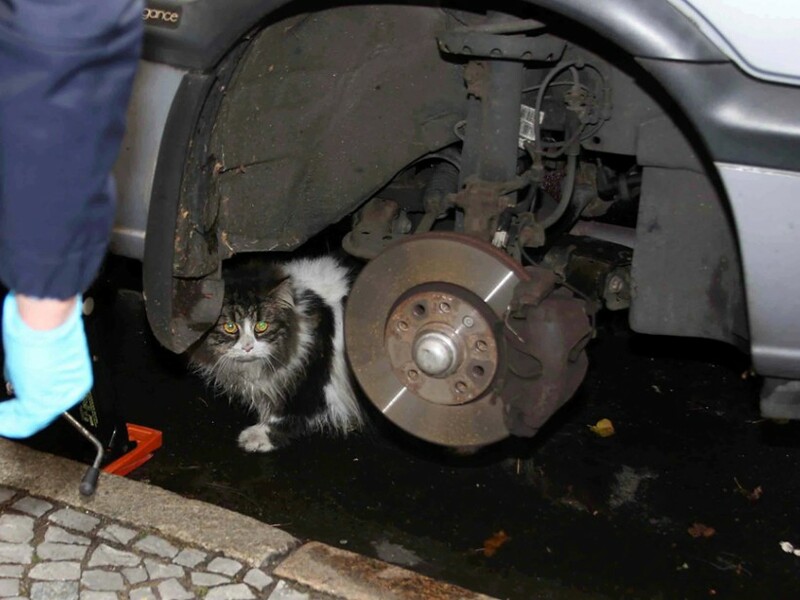 For instance, a lovely black and white Persian was discovered November 5th inside the engine of a blue Opel that was parked on Hertastraße in the borough of Neukölln in southeast Berlin. The fire department was summoned and promptly removed the right front wheel but the cat adamantly refused to relinquish its newly found resting place. Finally, a policewoman arrived on the scene and she was able to lure out the cat with the promise of some treats. 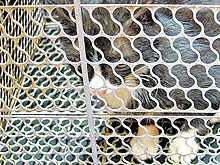 The nameless cat then was taken to an unidentified veterinary clinic near Düppel in the neighboring borough of Steglitz-Zehlendorf. Several weeks earlier in either late August or early September, an eight-week-old gray female later dubbed Odyssey was discovered in the right front wheel well of Cranford, New Jersey, resident Lisa Ford's Honda Odyssey Minivan. She first became aware that something was amiss when she and her daughter were out running some errands around town and heard unexplained noises coming from the engine. She then pulled into Kurt Petschow's Sunoco station on Centennial Avenue where he graciously interrupted his busy day in order to mount what ultimately proved to be a highly successful rescue effort. First, he had to locate the source of the noise, however, and that proved to be anything but a simple task. He accordingly took Ford's old jalopy for a test drive and when the strange noise commenced once again he initially thought that it possibly might be coming from one of the toys that were scattered about the interior. Once that was proven not to be the case he parked the car in back of the station not only in order to dismantle parts of it but to spare Ford's young daughter the possibility of having to witness an injured cat being removed from it. A little over two hours later, Odyssey was discovered but, unlike Mausi, she was unharmed by her death-defying ordeal. An employee of the station, identified only as Joanne, then took her to a veterinarian in nearby Westfield for a check-up and some unspecified jabs. In much the same vein as the generosity demonstrated by Hannelore and Erich B., Petschow refused to accept Ford's offer to compensate him for his time and labor. "For this, no charge," he told the Westfield Patch. "We were more than happy to do this." He also went about the task at hand in a remarkably caring but yet professional manner. "Not once did he suggest that I was inconveniencing him or his staff," Ford added. "While I was distressed about the situation, Kurt was kind and reassuring." Countless other cats who become trapped inside car engines are nowhere nearly as fortunate as Odyssey. 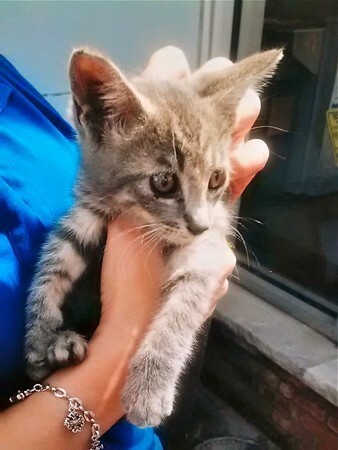 For example, back on December 23, 2005 an eight-month-old gray and white kitten subsequently named Miracle crawled into an SUV parked in Newark and as a consequence was forced to hang on for dear life to the drive shaft during a hair-raising seventy-mile jaunt down the New Jersey Turnpike. As the unidentified driver neared Exit 4 in Cherry Hill a passing motorist noticed Miracle's predicament and took immediate action. "There's a cat under your car!" the eagle-eyed driver yelled. A fourteen-week-old black cat named Trace from Monmouth, Illinois, fared even worse when she took refuge in a car's engine in early October of 2010. In particular, her mistake in judgment cost her both of her rear legs. One of the most heinous and detestable acts of animal cruelty imaginable occurs whenever owners elect to get shed of their unwanted cats by dumping them on busy thoroughfares. That almost always ends up with the cats and kittens being hideously crushed to death underneath the wheels of oncoming motorists who are totally unwilling to either swerve or brake around them. Despite the ubiquity of mobile phones, only rarely are any of these villains ever apprehended. Since these hideous crimes are committed in plain view, the only logical conclusion to be drawn from the appalling inaction of most motorists is that they do not find anything disturbing about such aberrant and patently criminal behavior. In spite of the gigantic odds against them, a few of these horribly abused cats and kittens still mange to survive. Some of them are able to make it to the safety afforded by nearby woods and bushes while others owe their lives to a handful of observant and caring motorists who stop and mount rescue attempts. For instance, at around 6 p.m. on October 11th an unidentified female motorist on the A81 near Horb in southwest Baden-Württemberg spotted two simply adorable brown kittens on an exit ramp. She promptly notified representatives of Tierschutzverein Horb who, upon arrival, worked well into the night in order to locate and rescue them. Although the kittens were famished, their fur was in excellent condition and free of both fleas and ear mites. 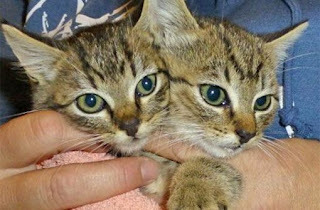 They immediately were placed in foster care where they were expected to remain until being vaccinated and, hopefully, rehomed. Although it normally is not a good idea under any circumstances for a cat to crawl into the undercarriage of an automobile, that rule does not necessarily apply to those that already have been abandoned in traffic. 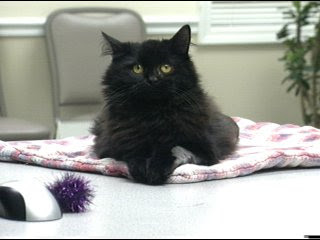 That is exactly what a black kitten named Miracle had the presence of mind to do on June 22, 2009 after she cruelly was abandoned on the McClugage Bridge in Peoria, Illinois. Of late, some motorists have become so emboldened as to toss cats out the windows of their chariots at gas stations. That was the terrible fate that befell a four-year-old brown and white tom named Diesel last June 9th. Later in the year on September 19th, a handsome black and white tom named Jim was found inside a potato chips' box at a Shell station on Halbeath Road in Dunfermline, Fife. His plight was discovered by an unidentified Good Samaritan who immediately contacted the Scottish SPCA. "The garage is on a very busy main road and Jim could easily have been run over and injured so we're glad he is now safe," John Chisholm of the SPCA told the Dunfermline Press on September 26th. 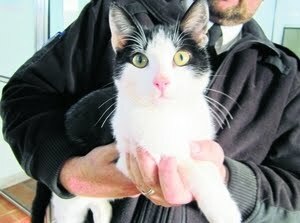 (See "Cat Found in Box at Busy Petrol Station.") "He's a really friendly guy in good condition so he obviously has been someone's pet until recently." A thorough review of footage taken by a surveillance camera failed to turn up any images of anyone abandoning Jim so it is unclear whether he was dumped there or simply crawled into the box. He later was transferred to the charity's Edinburgh and Lothians Animal Rescue and Rehmoing Center in Balerno, outside of Edinburgh, and eventually placed in a new home. Perhaps the most inexplicable incident in recent years involving cats and petrol occurred early last year in, of all places, Brunei, when a black and brown cat later named Si Anam was found on an unmanned Royal Dutch Shell oil platform twenty kilometers from land. The stranded cat, who otherwise would have surely died, was stumbled upon by electrician Hamdi Adnan when he was sent to the platform to perform some routine maintenance. Since it is highly improbable that the cat swam out to the platform, the most plausible explanation is that it either arrived there as a stowaway or was purposefully abandoned. Since it does not speak any language that humans can comprehend, the true story of its arrival likely never will be known. Automobiles additionally pose several unintended, albeit no less dangerous, perils for cats. In particular, they sometimes are stolen with felines trapped inside them. Besides the threat posed by car thieves, antifreeze that either leaks from radiators or is intentionally put out kills countless cats each year. Heat exhaustion and dehydration that quickly ensue whenever they are locked inside airtight automobiles for long periods of time during hot weather are two additional concerns. Aside from the heinous crimes perpetrated against them by ornithologists and wildlife biologists, cats face perhaps no greater menace than that posed by drivers who intentionally run down and kill them. Even so much as a cursory examination of the types of injuries sustained as well as the location of corpses strewn alongside roads and streets makes it perfectly clear that every single one of these deaths was premeditated. Nancy DeSanto's disturbing experience on Haystack Road in Palm Desert, California, illustrates that point. 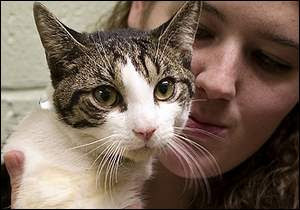 On April 10, 2010, she and her young daughter discovered a kitten who had suffered a broken back but was still alive after having been struck down by a hit-and-run motorist. She attempted to get other drivers to stop so that she could pull the kitten out of harm's way but they stubbornly kept right on coming until finally one of them at the wheel of a white GMC SUV struck the kitten again and this time broke its neck. That was the end of its short, tragic life and, almost every bit as reprehensible, the driver got away scot-free with his hideous crime. "The little kitten died in the arms of a child who still has the capacity to love unconditionally," DeSanto later told The Desert Sun of nearby Palm Springs on April 18, 2010. (See "Drivers Ignored Cries to Help an Injured Kitten in the Street.") "Too bad we as adults have become so callous." Those bits of anecdotal evidence are buttressed by the well-known fact that cats are agile and fast in addition to being terrified of loud noises and large objects. Just as importantly, motor vehicles of today are equipped with braking and suspension systems that allow them to be brought to a screeching halt on a dime. In spite of all of that, it is doubtful that any motorist ever has been arrested for running down a cat. That petit fait alone is as good of an example that there is of just how little regard this world has for the sanctity of feline life. Furthermore, there are very few feline protection groups that are even willing to publicly mention, let alone champion, this cause. Despite the large volume of annual feline traffic fatalities, only a handful of them ever make the news. Nevertheless, those deaths that are reported only can be described as heartbreaking. Cats most assuredly have a right to be outdoors. They are not second-class citizens of this planet and therefore should not be treated as such. Nevertheless, they do not belong anywhere near speeding motorists. To turn them loose in busy streets, however, constitutes the very epitome of irresponsibility. In rural areas as well as quiet urban residential districts that are free of both human and animal predators they should be allowed outside. In other instances they need to be provided with fenced-in yards that are covered on top with nets. Unfortunately, cats without homes do not have any choice in the matter other than to play Russian roulette with motorists whenever they are compelled by necessity to venture across dangerous streets. All cats need and deserve far better legal protection than they now enjoy but this is acutely the case for these impecunious cats. In Deutschland, for example, several communities have enacted thirty kilometer speed limits while in England a number of them have imposed twenty mile an hour restrictions. Moreover, the benefits to be derived from such laws extend far beyond the safeguarding of cats. All animals in fact benefit when motorists are forced to reduce their speed. So, too, do pedestrians and bicyclists. Such limits additionally decrease auto emissions and potentially even could slow down global warming. "People have gradually been more and more sidelined by motorized traffic, and a bit of a backlash is happening," is how Tom Platt of Living Streets characterized England's go-slow revolution to USA Today on February 22nd. (See "Brits, Start Your Engines -- but Don't Go over Twenty Miles Per Hour.") "People want to reclaim their streets." Oxford, Cambridge, York, Bath, Bristol, and Liverpool now have in situ twenty mile per hour speed limits on all of their residential streets and even on some of their commercial routes as well. Such a bon sens measure never would stand a chance of being enacted in a country like the United States where running down cats, pedestrians, and bicyclists has become a national pastime thanks, in no small measure, to the total unwillingness of the worthless law enforcement community to enforce the rules of the road. Photos: TZ-Online (Mausi), WTVC-TV of Chattanooga (kitten), Berliner Zeitung (Neukölln Persian), Cranford Sunoco (Odyssey), Douglas M. Bovitt of Gannett (Miracle), WHBF-TV of Rock Island, Illinois (Trace), Tierschutzverein Horb (abandoned kittens), Victoria Schilde of Aschaffenburger Tierheim (Diesel), Dunfermline Press (Jim), and Borneo Bulletin (Si Anam).